17 top 3 players and ratings. My apologies if this has been posted. Ronaldo is gonna be a beast with the physicality. But I really want that Neymar but I'd be happy with either of the three lol. Unless I'm super lucky it'll probably take me some time to land either of them. Suarez definitely should be higher and so should Messi. It's the everlasting debate with Messi and Rondaldo. I wonder what Falcaos rating will be this year?.... 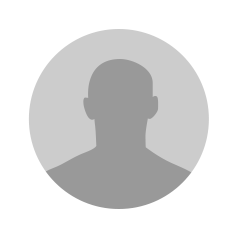 Will it be the largest rating drop over 2 seasons of any player ever on FUT? Ronaldo has higher passing than Neymar despite being a box player who barely ever hits through balls, and has 92 dribbling despite the fact that he can't dribble past a forumer nowadays. Could have higher shooting and physicality maybe, but he misses a lot too. Messi's stats are perfect except for the passing, he should be the best passer in the game. In the end, even though Ronaldo's won the most important trophies, you can't really say that he played the biggest role in either of the wins, given the fact that the only top notch performance he delivered was against an incredibly poor Wolfsburg. And on the other hand, Messi has kept performing well week in week out, but that ****'s unlucky like a ****, and Ronaldo has a 4 leaf clover up his **** the lucky ****. 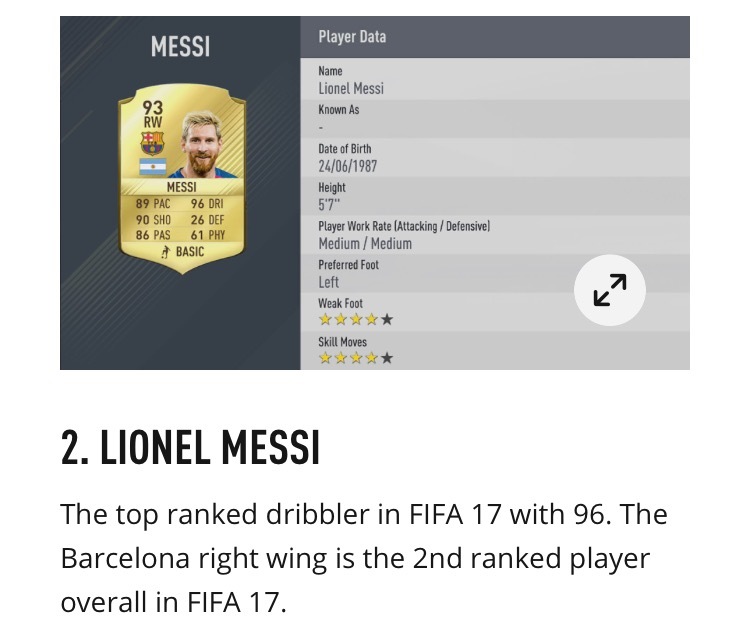 There's no way Neymar should be one rating below Messi. Shouldn't even be the third highest rated player in the game. 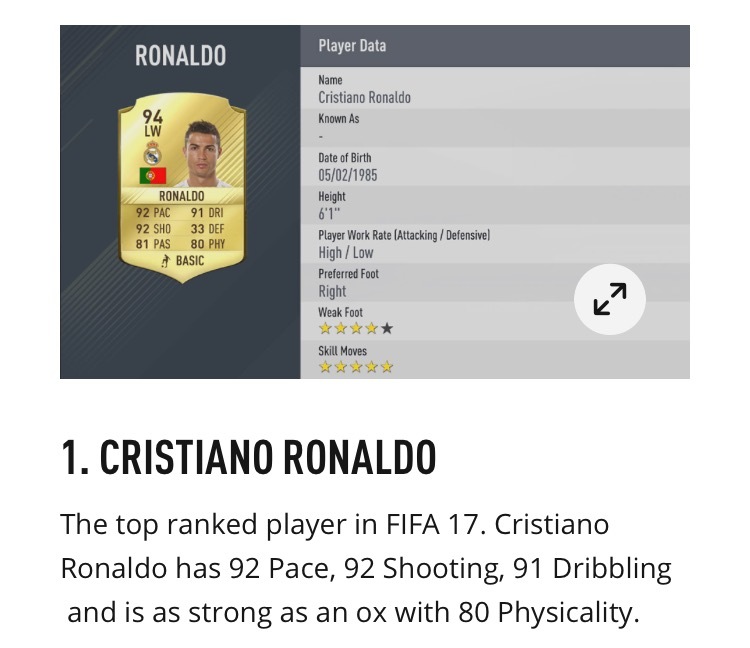 Agree that Ronaldo warrants the top rating though. 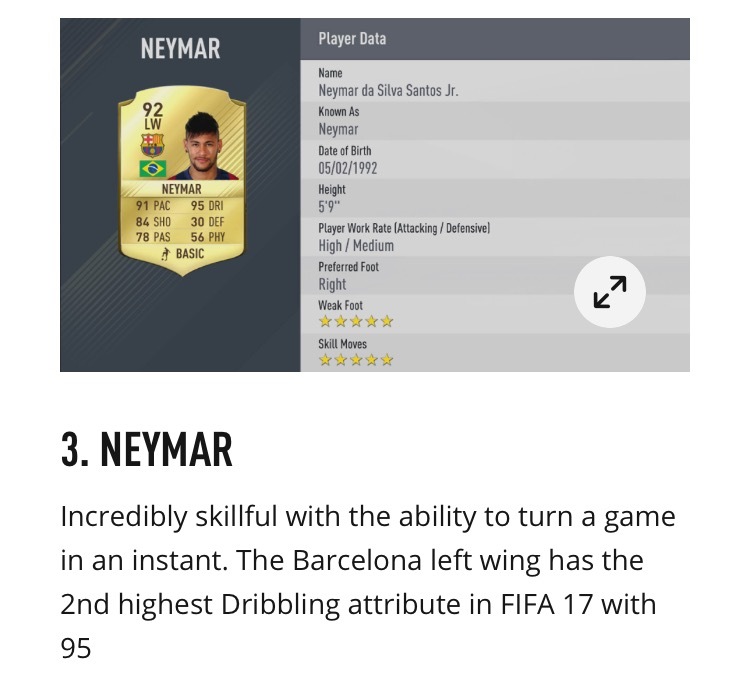 Suarez should have been third, 91 rating and Neymar fourth with a 90. I guess you didn't watch the games. I would explain how for every goal that Suarez scores, he misses 4 sitters set up by Messi, but you wouldn't understand unless you were to watch those games. Sure, 4 sitters every game. I love how apparently you never watched the games as soon as you say something against Messi I watched the games and Messi was truly sh*t, couldn't score, couldn't step up, couldn't help his team. And same in the champions league, Suarez should have already seen red in the first leg against Atletico, but he hadn't and then scored afterwards. Then in the 2nd leg Atletico dominated and Messi managed to get 0 shots on target his team needed him and he did less than nothing. Oh and lets not forget the awesome pen for Argentina so no Messi was far far from performing week in week out, as was Ronaldo yes, but every player had his bad games last season, the difference is Ronaldo still won the most important trophies hence why he's higher rated than Messi. It was actually 4 games, 6 if you include the 2 Atletico CL matches. In the last 5 games of the season Messi scored 3 and assisted 6.